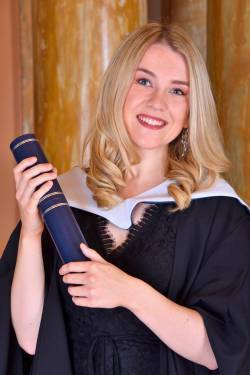 A graduate from Scotland has won two top podiatry awards at the recent Queen Margaret University (QMU) graduation ceremony in Edinburgh. Rowan Nicolson, 23, was presented with the prestigious Canonbury Award for Academic Excellence (Top final year student) and the OSGO Healthcare Award for Clinical Audit. Canonbury and OSGO are two of the UK’s leading podiatry product specialists. “I’ve truly loved my time studying podiatry at QMU. The lecturers are brilliant, ensuring that graduates are fully equipped with the skills and confidence to enter the workplace. I’d wholeheartedly recommend this course to all prospective students who are interested in a career in healthcare”.